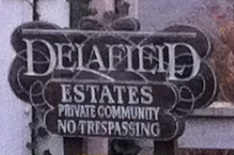 Delafield Estates is a Private Gated Community in the Riverdale on Hudson section of the Bronx. Spanning nearly 11 Acres, over 70% of which is permanently preserved as natural open space, Delafield was once owned by early Bank of America President Edward Delafield who resided in a mansion on the property, before donating it to Columbia University in 1965 in hopes it would become a botanical garden. Ultimately, it was transformed into a private community which is governed by the Delafield Estates Homeowners Association (DEHOA) who work to ensure that it remains a lovely and peaceful place to live.